Chili's Fundraiser for St. Jude Children's Research Hospital, originally uploaded by rogercarr. I stopped in at a local Chili's Bar & Grill for dinner last night. I discovered they are donating all of their profits on Monday, September 27 to St. Jude Children's Research Hospital. This is a great example of cause marketing. Most restaurants offer 10% of the proceeds to a charity on a specific day for the people who bring in a flyer or coupon. That is not what this fundraiser is all about. 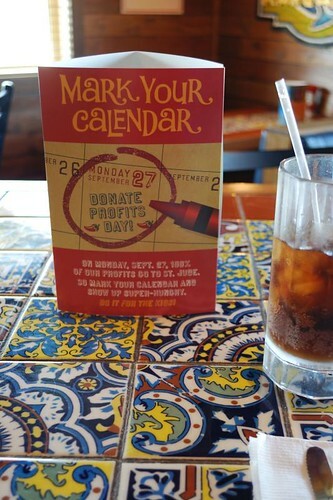 Chili's is donating all the profits from everyone who does business with them that day. Mark your calendar now. Go to http://www.createapepper.com for more details about the fundraiser and the ways you can participate. Giving gift certificates for a meal at a great restaurant is a great way to thank or encourage someone. There are people that do things for us everyday. Why not thank them in this unique way? There are also people that each of us know that could use something to build their enthusiasm. Why not personally give them the gift of being served a terrific meal? It is even a great gift idea for celebrating the holidays. I have done this several times and you should too. However, I am going to let you in on a Big Secret. You don't have to pay full price for restaurant gift certificates! There are many great restaurants that are offering gift certificates at a substantial discount. You don't even have to spend the time traveling to the restaurant to purchase them. They are available to you right from the Internet. Saving time and money, what could be better? Go to Restaurant.com to purchase your gift certificates. They save you time by making it easy to search for restaurants by locality. They make it even easier by allowing the recipient to pick their own restaurant from the thousands of restaurants listed at the Restaurant.com website. While you are purchasing the gift certificates for those on your list, don't forget you and your family. It is a great way for you to save money while dining out as well.